Tacos Perez got mostly 5 star reviews on Yelp. The lowest rating was a 4. I braced myself for the worst. Tacos Perez parks at the corner of Vermont and Adams in front of the Ralphs Supermarket. There’s a mish mash of people at this corner. Between local residents, USC students, transients that mutter to themselves as they walk by, and the occasional caballero wearing white boots, tight jeans, and studs on their collar the people watching alone is worth the trip. I ordered carne asada, al pastor, and suadero. 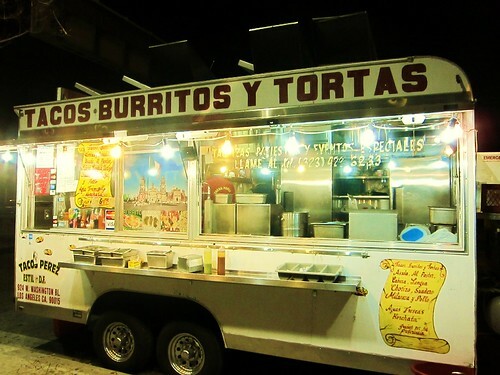 The tacos are described as DF style which stands for Distrido Federal Mexico (Mexico City). 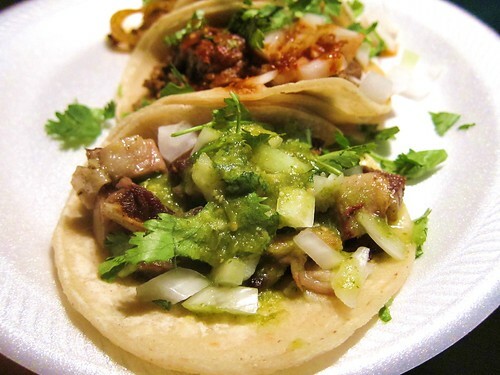 I’ve never been to Mexico City but I know that tacos de trompo are the regional dish of DF. 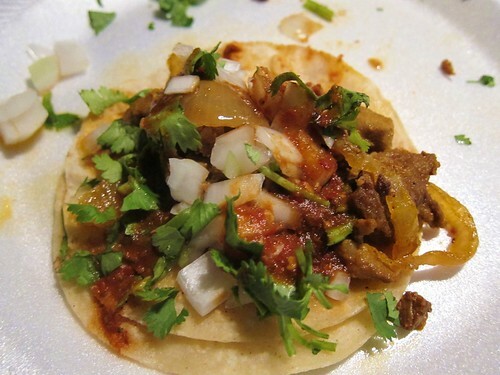 And since I didn’t see a trompo inside the taco wagon I was curious what was DF about the tacos. I doused the suadero with salsa verde and the al pastor and carne asada with roja. The suadero was way too fatty. Every cube of beef rib had an attachment of fat on it. A little fat would get lost in the mix but when every bite is the type of gummy fat that sticks to your teeth it’s tough to get through. The al pastor was the worst kind of al pastor. Ground pork mixed with grilled onions that have been overcooked to the point of being mush. There’s no reason this taco should have the name al pastor attached to it but this kind of taco gets passed off at a lot of LA trucks as al pastor. It’s not al pastor. And it’s certainly not DF. 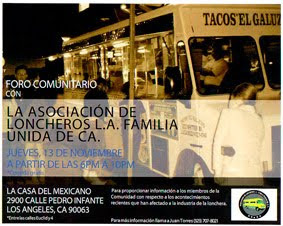 The carne asada taco was quite good and I could see how someone who only eats asada could be loyal to Tacos Perez. 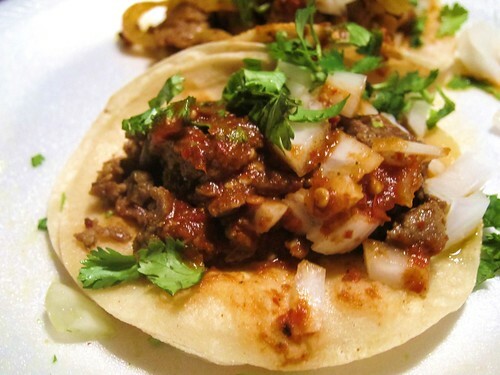 Two well oiled corn tortillas, finely chopped beef, onions, cilantro and a chile salsa. 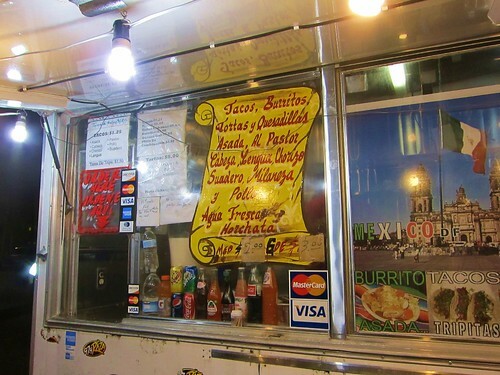 This kind of taco was likely most everyone’s first introduction to a taco truck taco. A little more exploration of the area revealed another taco truck at the northwest corner of Vermont and Adams. But I had had enough for the night so I scribbled down the location in my book,crossed off Tacos Perez, and headed back west. Adams Blvd. and Vermont Blvd.